The Second Church Estates Commissioner is by convention an MP drawn from the governing party in the House of Commons. The Commissioner’s primary parliamentary role is to answer oral and written questions from MPs about Church of England matters. The current Second Church Estates Commissioner is Rt Hon. 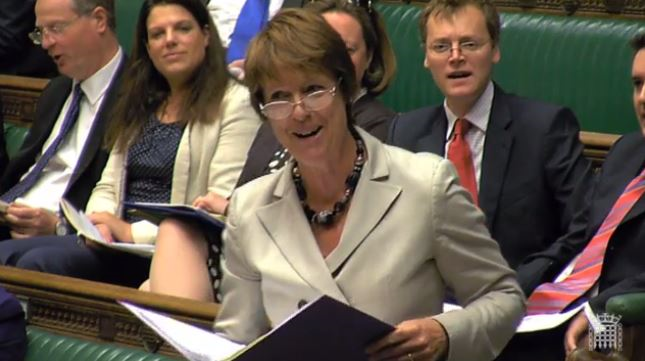 Dame Caroline Spelman MP, Conservative MP for Meriden. The Second Church Estates Commissioner provides an important link between Government and the established Church of England and maintains the statutory accountability of the Church Commissioners to Parliament. It is a Crown appointment, made on the advice of the Prime Minister and whilst it is honorary and unpaid, the position of Second Church Estates Commissioner is included in the published list of Government members. The Second Church Estates Commissioner handles correspondence from MPs, parishioners and others on a range of church affairs and is often asked to comment on church matters by the press. She is supported in this role by the Parliamentary Unit and other relevant staff based at Church House, Westminster. She also plays an important advisory and advocacy role for other Church of England bodies in their contact with Government and with MPs about legislative issues affecting the wider church. Questions from MPs to the Church Commissioners takes place on the floor of the House of Commons once every four weeks when the House is sitting. The allotted time of fifteen minutes for questions is shared with representatives of other (non-Church) bodies that are accountable to parliament. The Second Church Estates Commissioner also answers formal written questions tabled by MPs. The Second Church Estates Commissioner answers in relation to the Church Commissioners’ wider trustee responsibilities, namely the management of their investment portfolio; their funding commitments for clergy pensions; the work of bishops and cathedrals; the support of parish ministry in areas of need and opportunity; and the administration of the legal framework for pastoral reorganisation and settling the future of unused church buildings. In recognition of the fact that these responsibilities are closely interwoven with the full range of the Church of England’s activity – its nationwide ministry and the upkeep of its built heritage – the Second Commissioner also speaks more broadly to those areas when such matters are raised by MPs. The Second Commissioner is an ex-officio member of the General Synod’s Legislative Committee, which conveys draft legislation from the General Synod to Parliament. Her role there involves advising Synod officers on the handling of the Church’s relationships with Parliament. She is also a member of Parliament’s Ecclesiastical Committee, the joint committee of both Houses that scrutinises that draft legislation, and has responsibility for steering the legislation through the House of Commons (in the Lords this is done by the bishops). The ‘steering’ process also involves liaison with the House authorities to ensure smooth and timely passage of the legislation. The Second Church Estates Commissioner is a Governor of the Church Commissioners and is an ex-officio member of the Church of England’s General Synod . The post-holder is required to be a confirmed lay member of the Church of England. Although the Second Commissioner is an ex-officio member of the General Synod’s Legislative Committee, she is not a member of any of the Commissioners’ other committees. She is however entitled to attend and speak (but not vote) at any of their meetings, including the AGM. For more on the Commissioners, click here. For a list of past occupants of the post of Second Church Estates Commissioner, click here.